– Small bounce off of key technical levels brings many cryptocurrencies into interesting and possibly bullish trading conditions. – We’ll look at some key and important high market cap coins. Above: Tight trading against the bottom of the cloud. Bitcoin’s daily Ichimoku chart is actually displaying a different kind of behavior than we have been used to ever since the December 2017 all-time high. This extended bear market has caused any small or large approach towards the cloud to result in a strong sell-off – except for this most recent approach. Instead, we’ve observed price actually constrict. And as price has constricted, we’ve approached a condition where the future cloud is thin. And a thin cloud is a weak cloud – creating conditions to make a break higher much easier. 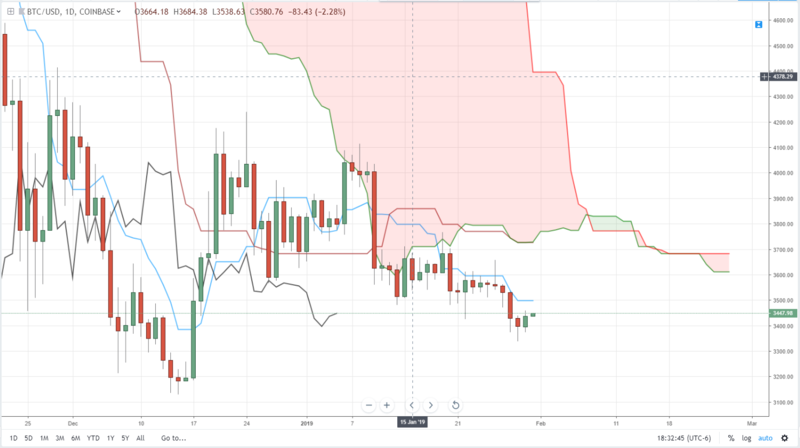 February 8th would be the earliest time that we would see Bitcoin trading near a weak and thin cloud, with a price target near the 3850 zone for a bullish drive. Above: Ethereum facing some pressure with the Lagging Span near the cloud. Ethereum is actually in a condition that Bitcoin will have to wait over a week to see. 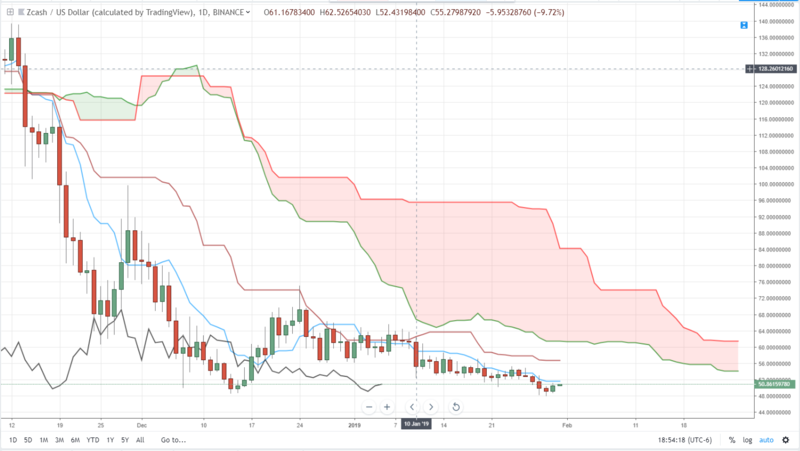 Ethereum is currently trading just below a ‘Kumo Twist’ (Senkou Span A crossing Senkou Span B). What is more important is that the current cloud is green – and Senkou Span B is flat. 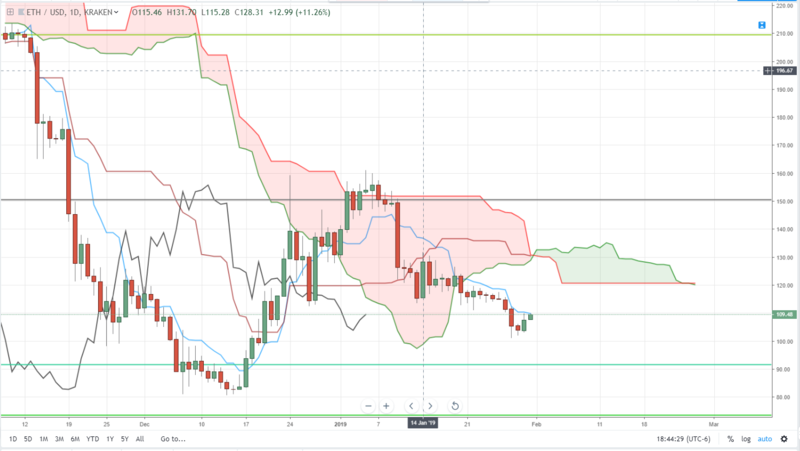 While it looks like there is a clear move between the current daily candlestick and the bottom of the cloud (sitting at 128 to 134), the most important factor here is the Lagging Span and its proximity to the bottom of the cloud, which rests at 114. Remember, the Lagging Span reacts to Ichimoku areas of support and resistance the same way price does. And the Lagging Span is up against a thick Cloud, which is strong resistance. 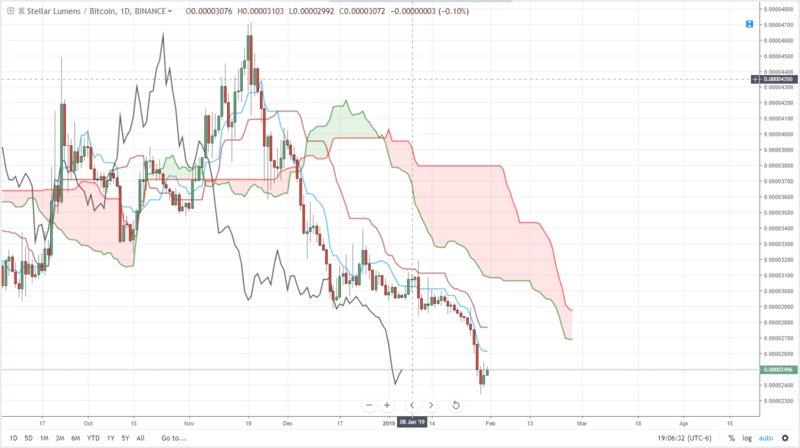 Above: ZCash created new 2019 lows. ZCash has suffered some major blows throughout 2018 and into 2019. The listing on Coinbase caused a small pump, but ultimately it took a nose dive. And the nose dive has, for whatever the reason, been a particularly nasty one where it continues to print new lows, the most recent all-time low being hit on the 29th of January 2019. There may be some reprieve though. Prices have certainly consolidated and the movement down has been slower. We’re even seeing the cloud – while thick and red – constrict and become thinner. If this keeps up, then we could see a nice breakout condition near the middle of February. Above: Oversold conditions leave room for a mean reversion trade. Stellar is one of the few cryptocurrencies that have a use case and some strong partnerships. While it is incorrectly compared and pitted against Ripple (XRP), it is still one of the few cryptocurrencies that have a ‘product’ working and out. But it also has one of the ugliest and most bearish looking charts out of all cryptocurrencies – certainly the ugliest in the top 20. New 2019 lows were made on the 29th and it’s trading just a hair above the March 2018 low. But I see a possible slingshot move ahead. Price is a significant distance from the Base Line and the cloud, while red, is actually not that thick. In fact, if we look at the current Conversion Line and Base Line, we know that the future cloud will also be fairly thin. This provides a good base not only for a quick mean reversion trade, but also a probable slingshot move up much higher. Save money on your currency transfers with TorFX, voted International Money Transfer Provider of the Year 2016, 2017 and 2018. Their goal is to connect clients with ultra competitive exchange rates and a uniquely dedicated service whether they choose to trade online or over the telephone.